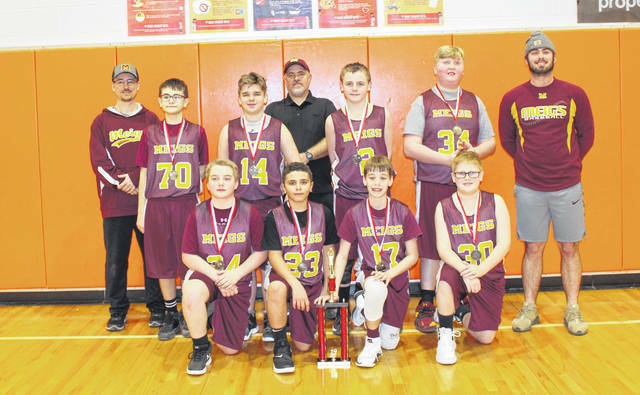 The Meigs (Martin) 6th Grade Boys Basketball team earned second place in the Hocking Valley Basketball League Tournament this weekend. The team has a 5-2 regular season record, with a 3-1 record in the HVBL Tournament. The Marauders were defeated 30-27 by Vinton County in the Championship. The team also placed second in the Pomeroy and Middleport Youth League Holiday Tournament held in December in Rutland. Pictured are players (front, from left) Wyatt Howard, Mason Qualls, Cayden Gheen, Joseph Schuler (middle, from left) Henrik Price, Braden Hawley, Jake Martin and Aiden Justice; (back, from left) Coaches Pat Martin, Rick Price and Kaileb Sheets.